Paul Costello, three-time Olympic Champion. My early 20s. I started out like anybody else—a nobody. I won one race the first year. After that, it was rather discouraging to think you’re going to go back and try to win some more. The next year I won three or four. I was motivated terrifically by that. I had a beautiful physique built up from gymnastics and I had the right type of ego that I was going to win. Was the 1920 Olympics your first? Didn’t you also break the world record in single sculling—the 2000 meters? 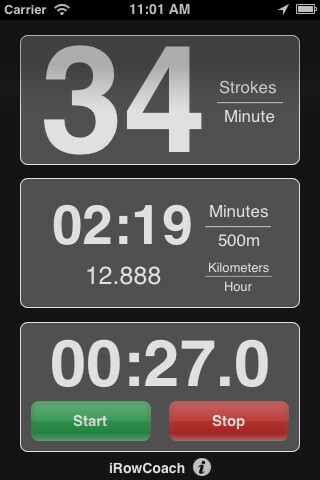 I rowed a challenge race on the Schuylkill for 2000 meters (5/26/24). It went down as a world record. I won the Gold Cup – the (solid gold) cup was beautiful and was under strict bond. We drank champagne out of it. I had it a couple of days before it went in the vault. I am the only American athlete to win the gold three times and I could have made it four. Could have gone to California [1932 Olympic Games in Los Angeles]; Kelly and I would have won out there. 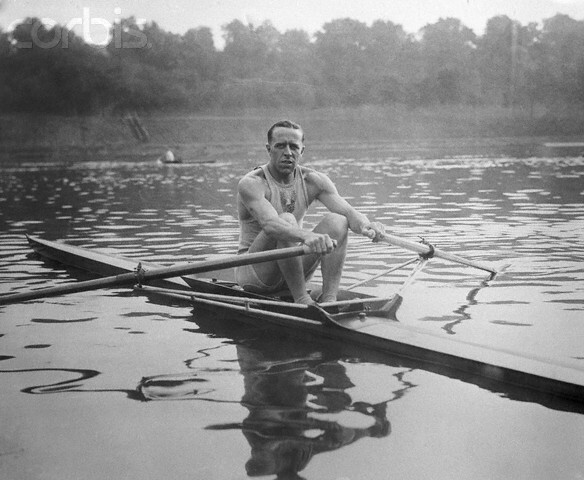 (Costello was the first person to win the gold in the same event – the double scull – at three consecutive Olympics). Why didn’t you try for four? I fell in love. I had to get some money together to get married. When you’re an athlete you don’t care. I was the leading Ford salesman in Philadelphia. I shouldn’t say this but, as a competitive sport, rowing is one of the toughest. You’re rowing with all your body. You get a terrific amount of power from your legs. Naturally, your arms. Some people, I guess, they never really get the proper timing, they get discouraged and they stop. I fell in love with rowing. The Schuylkill River is one of the outstanding rivers to row on. *Warm thanks to The Fallser newspaper for allowing HTBS to republish this article, which was first published in The Fallser, August, 2009. The easiest way you can keep track of new entries on this blog is to subscribe to HTBS. You only have to fill in your e-mail address up on the right, 'Follow HTBS by Email', and you will receive an e-mail in your inbox each time there is a new entry on HTBS - and, yes, it is of course free! During the crew’s voyage, the media has pumped out the message that these fellows, four with severe injuries from serving in Afghanistan and Iraq, are trying to prove that anything is possible. That is what these brave men now have proved. Well done! This summer will see many celebrations in the United Kingdom and the Commonwealth to mark 60 years since Elizabeth II became Queen. The only other British sovereign to celebrate a 60-year reign (a ‘Diamond Jubilee’) was Queen Victoria in 1897. Both boats and the River Thames will play a big part in marking the event. Between April and September, the National Maritime Museum at Greenwich, London, will hold an exhibition called ‘Royal River: Power, Pageantry and the Thames’ which ‘explores the relationship between the monarch, the City and the people, as it was brought to life on the Thames – London’s greatest thoroughfare’. I particularly like the Canaletto painting that they show on their website entitled The Thames on Lord Mayor’s Day... It is a pointer towards the other river related event of the Jubilee. "Music will also be an integral part of the celebrations and pieces commissioned for the event will receive their world premiere on special barges… Downton Abbey composer John Lunn was commissioned with nine other film composers to create a new movement using the original titles of Handel’s Water Music for inspiration." The flotilla will be in ten sections of various types of craft but it is the first group, the ‘manpowered section’, that will be of most interest to HTBS readers. 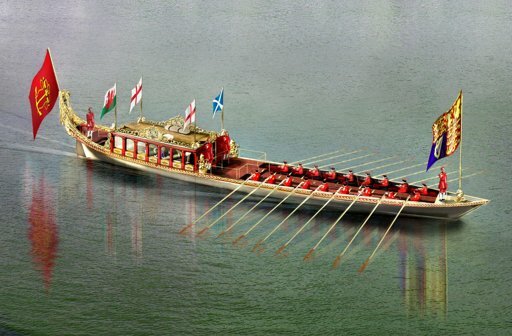 It will be led by Gloriana, the new royal rowbarge. It will be followed by shallops, Thames watermen’s cutters, gigs, skiffs, Dragon Boats, kayaks and many more rowed, sculled and paddled craft. Follow the link on the website’s FAQ section to a pdf of all the boats taking part (‘vessel factsheet’). 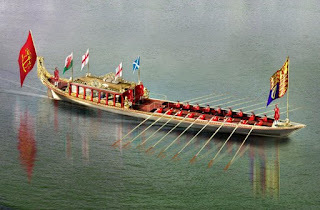 An artist’s impression of the Gloriana, an 88-foot / 27-metre ‘rowbarge’ decorated in gold leaf and propelled by eighteen oarsmen, was released a few days ago. It is half way through a twenty week build ‘at a secret location in West London’ and it is said to be ‘the largest rowed vessel in the UK today’. The London Evening Standard newspaper claimed first sight of the work in progress. Unfortunately, it would be unsafe for ‘fine boats’ to take part in the event. It will be held at the top of the tide with hundreds of powered craft churning up the water so there would be a real danger that racing boats with low saxboards would be ‘swamped’. 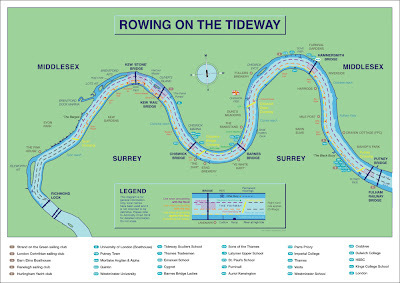 While the River Pageant will undoubtedly be a splendid occasion, it will have slightly unfortunate consequences for Putney based rowing clubs. The details are not yet finalised but temporary moorings to accommodate many of the participants will have to be put in between Hammersmith and Putney. They will take some time to be installed and removed and they will not leave room for safe rowing on a considerably narrowed river. Work will start after the University Boat Race (on 7 April) and rowing boats may not be allowed to pass perhaps for most of May and some of June. 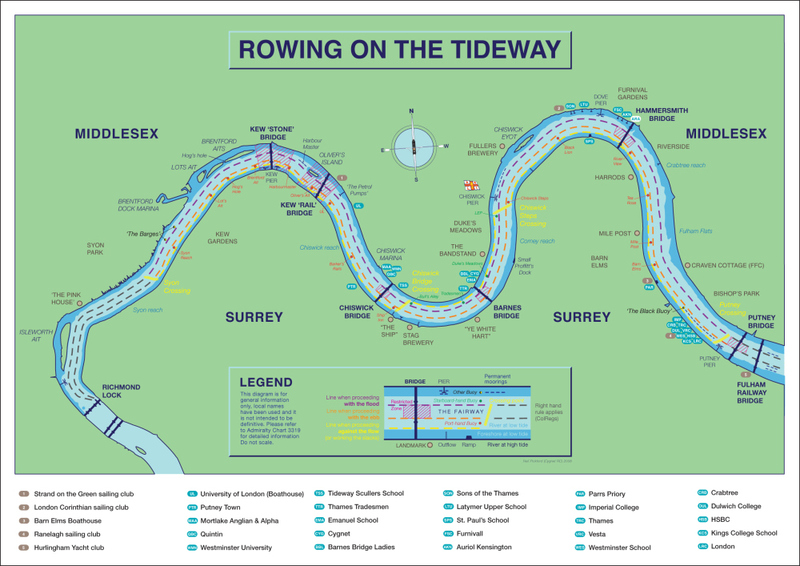 This means that big clubs such as London, Thames, and Imperial College will have to row downstream of Putney Bridge (towards Wandsworth) where the embankments mean that water is often rough when the tide is higher. Of course, those based upstream of Hammersmith Bridge will have the river to themselves. Reports of schadenfreude by the smaller clubs of Hammersmith, Chiswick, and Mortlake will, I am sure, be denied. Yesterday, on HTBS, I pointed you readers in the direction of the Daily Telegraph which had interviewed solo-rower Andrew Brown, who broke the world record crossing the Atlantic earlier in January. In this interesting article, Brown says that "My heroes are the old-fashioned hardy sailors like Chay Blyth and Robin Knox-Johnston, who thought that if someone had to come and rescue you, then you would be putting them in danger. So if you get yourself into trouble, then you've got to get yourself out of it." 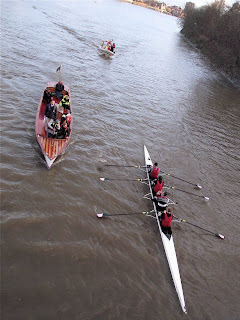 Dear reader of HTBS - on 12 March, 2009, I started this rowing blog, I guess out of being bored... At first, I thought that no one was actually going to read it, I did not even bother to put up a so called site metre. After a couple of months of blogging, I did realise that there were people reading it, and I have happily been blogging away ever since, now with help from rowing friends in France and England. However, when HTBS turned one year, I did ‘install’ the site metre, which earlier today showed that HTBS has had its 100,000 visit (with slightly more than 230,700 page views!). 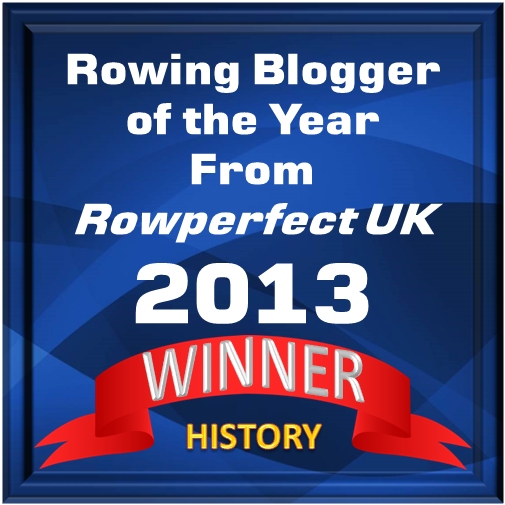 In the blogging world it might not sound like a lot, but for a blog dealing mainly with rowing history, it is incredible! My warmest ‘thank you’ to all you loyal readers of HTBS & and to contributors Hélène Rémond, Tim Koch, Greg Denieffe, and Philip Kuepper. Here is some more reports about the Talisker Whisky Atlantic Challenge – The World’s Toughest Rowing Race. As HTBS has mentioned before the all-female crew Row For Freedom in The Guardian has reached Port St Charles in Barbados. The women – Julia Immonen, Debbie Beadle, Helen Leigh, Kate Richardson and Katie Pattison-Hart – have set two world records: they are the first five-woman team to row any ocean in the world and have broken the record for rowing The Atlantic in the fastest time by an all-female crew. 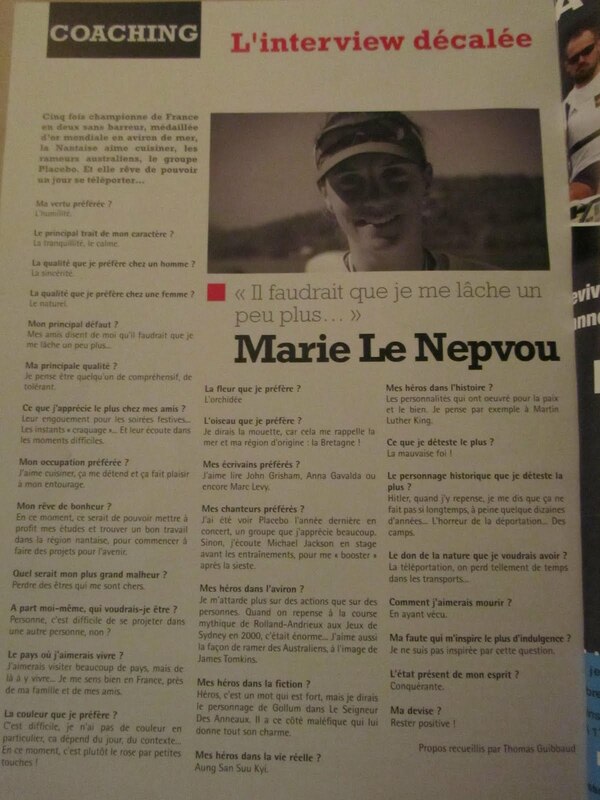 Here is an interview with the ladies, who almost seem to have laughed their way across the Atlantic. The team The Atlantic 4 with Adam Wolley, Greg Symondson, and twin brothers Hugo and Ross Turner came in on a third place. Coming in on fourth place was two Welsh firefighter, John Haskell and Jamie Windsor. Read article here and watch interview with these brave fellows. At the same time as these boats are arriving in Port St Charles, oarsman Tommy Tippetts has now left La Gomera for his solo-row to Barbados. Follow his voyage here. After I had posted “Downton Abbey & Vesta RC” on Sunday, 15 January, I received a couple of e-mails from Vincent McGovern, member of Vesta RC Committee, where he very kindly offered to help fill in some blanks in my 15 January entry about his club. For example, I did not know how many of Vesta’s member had died during the First World War, only that many did not come back, according to H.B. Wells in his Vesta Rowing Club: A Centenary History (1969). Of course, all the rowing clubs in Great Britain had the same problem at that time, the clubs were drained when the young members went to war, a war that many of them thought was going to be short-lived, which would not be the case. 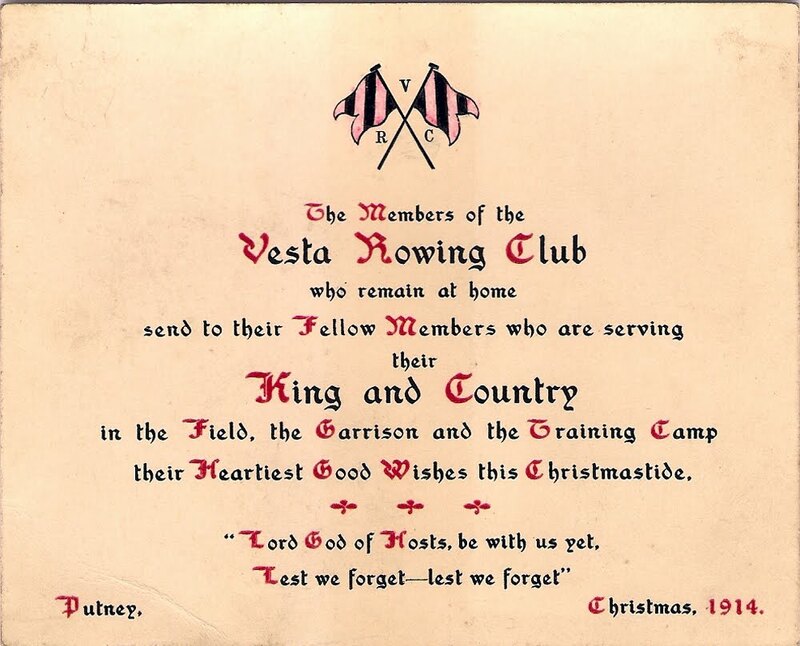 From a Vesta Committee meeting on 15 September, 1914, the minutes read that the club regatta has been abandoned due to ‘the very large number of members serving with the colours...’. In L.G. Applebee’s The Vesta Rowing Club 1870-1920 (1920), which Vincent sent a digitized copy of, the author writes that many older members helped the club to survive when it went ‘on the rocks’. 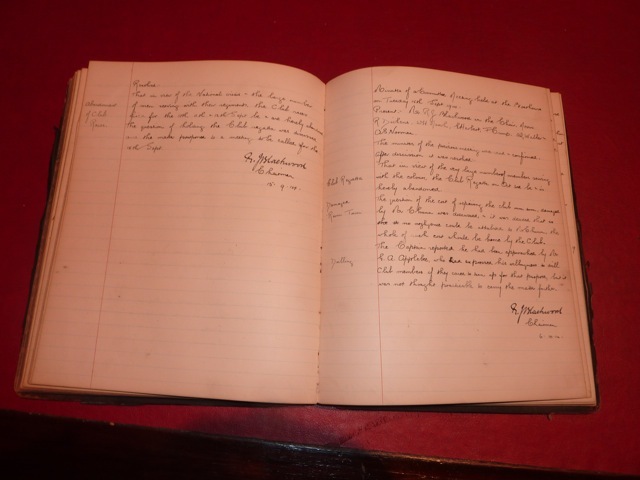 Applebee particularly mentions Dan Fitte, who gave 100 guineas to the club during this time which ‘kept the club clear of debt, whilst the young of the club were doing their bit’ (in the trenches). Fitte, who at the age of 40 sculled at the 1919 Peace Regatta at Henley, even beat ‘Gully’ Nickalls who was half his age in a heat, became a great access to Vesta RC in the future, serving as the club’s president between 1920 and 1951 (seen up on the right). 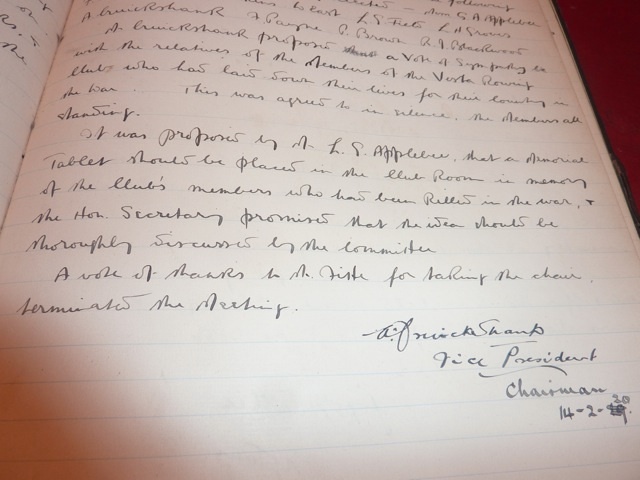 In his e-mail, Vincent points out an interesting thing about one of the names on the War Memorial, 2nd Lieut. C. Vincent. But let us look back to the year 1908 when a young Vesta member, Karl Schwerzl, had won the ‘Junior Sculls’ at Kingston, and the pairs with Dan Fitte at the Metropolitan Regatta. Four years later, in 1912, Karl went on to win the ‘Junior-Senior Sculls’ at three regattas, the Metropolitan, Reading, and Marlow – a promising oarsman, indeed. Then, at a committee meeting, on 6 October, 1914, the minutes for the meeting state that Mr. Schwerzl has changed his surname to “Vincent”. The man with the German-sounding name ‘Karl Schwerzl’ is suddenly ‘Charles Vincent’. He joined the The Buffs (East Kent Regiment) and died on 17 October, 1918. He now rests at Brancourt-Le-Grand Military Cemetery in France. It was not uncommon that English families with Germanic surnames changed their names to more Anglicised names during The Great War, Vincent mentions in his e-mail. 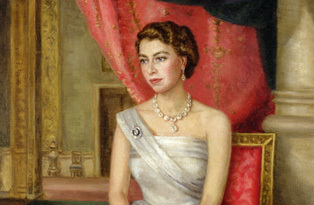 The most famous example is, of course, the British Royal family, who changed their House of Saxe-Coburg and Gotha to the House of Windsor, which King George V did in 1917. Vincent also brings up minutes from a Committee meeting held on 1 December, 1914, where the Hon. Sec. refers to ‘reply paid post cards’ (below). No one knows for sure, but ‘I wouldn’t be surprised if the cost of the Christmas Cards was included’, Vincent writes; that would then be one of the one’s that was featured in the “Downton Abbey & Vesta RC” entry on HTBS a week ago. 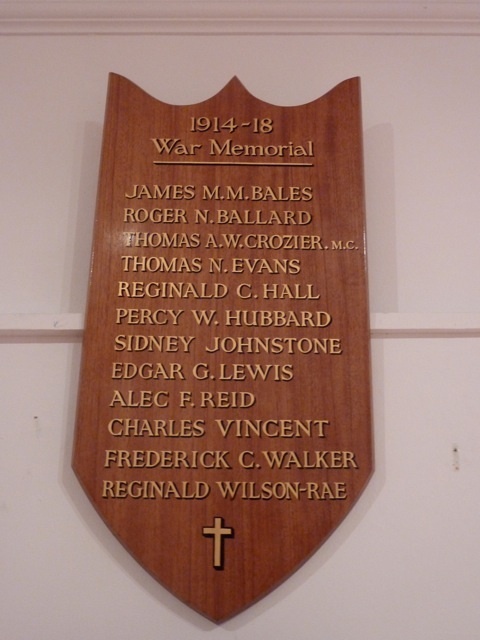 At the ‘restart’ of Vesta RC after the Great War had ended, the last point in the minutes from the 14 February, 1920, is the decision to create a War Memorial honouring the members who gave their lives serving their King and their country. 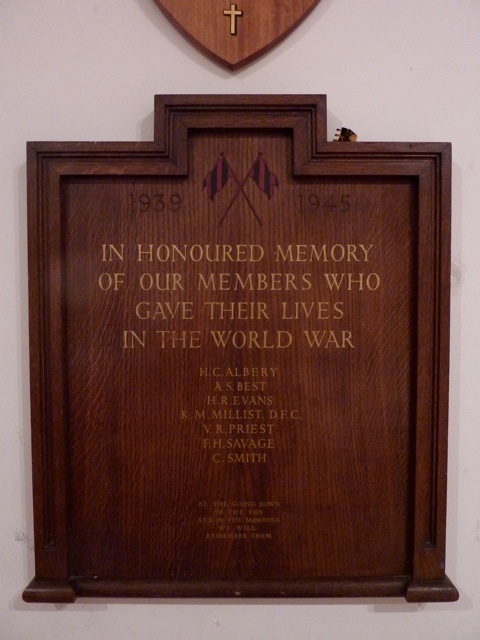 War Memorial for those Vesta members who died during the Second World War. My warm thanks to Vincent McGovern for all help with information, photographs and copies of Vesta RC Committee Meeting minutes. 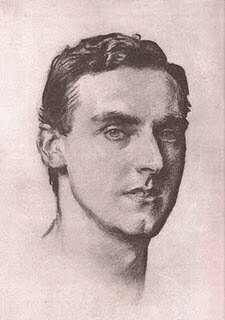 In yesterday’s post on HTBS we referred to rowing historian Bill Miller’s great website Friends of Rowing History. Today, we are actually going back to Bill’s site, now to have a look at a newly published list, which for sure will interest those of you who like ‘vintage rowing video clips’. Bill has put together a wonderful list of rowing films from British Pathé. You can easily browse the following categories: US People/Events; Henley Royal Regatta; Women’s Rowing; International Racing; Equipment; Eton-Oxford-Cambridge; Doggett’s Coat & Badge Race; and Misc. Clips. Go to the British Pathé list here. Below you will find two film clips from British Pathé that I picked specially for this entry, both dealing with the 1953 European Rowing Championships in Copenhagen, which were held on 14-16 August. Well, it says ‘Copenhagen’ – do not get fooled by the statue Den Lille Havfrue [The Little Mermaid] in the beginning of the first film – but the rowing championships were held outside of Copenhagen at the Gladsaxe rowing stadium at Lake Bagsværd. 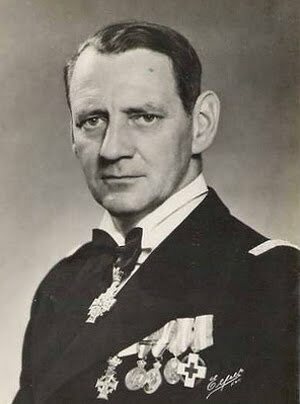 Among the spectators is King of Frederik IX of Denmark, himself an avid oarsman as a young prince. Among the oarsmen you see the English sculling champion Tony Fox (above), who had taken a silver medal in the single at the European Championships in 1951, a fourth place in the Olympic final in 1952, but on Bagsværd he never made it to the final. The gentleman in spectacles handing out the medals is the FISA president Gaston Müllegg. When the Danish coxless four won, King Frederik went down to the landing stage to congratulate his countrymen. There was an interesting event happening during these 1953 Championships. Before the men’s eliminating heats a women’s international regatta was held with female rowers from nine countries: Austria, Denmark, Finland, France, Germany, Great Britain, the Netherlands, Norway, and Poland. The following year, the first European Championships were held for women on the Bosbaan course in Amsterdam, on 20-22 August, 1954, while the men’s races where held on the same course on 27-29 August. 1) Special guest Peter Raymond, Princeton '68, 1968 Olympic Four & 1972 Olympic Eight, will give a talk entitled “The Transition to Ratzeburg Training & US National Camp System”. 2) Famous rowing historian and collector Tom Weil will entertain the crowd with “Cheers & Jeers: A Prospective on Women & Rowing from 1850 to 1900”. 3) Joanne Wright Iverson, who is the president of Vesper Boat Club and author of An Obsession With Rings, will give a talk called “National Women’s Rowing Assoc. & Modern Women’s Rowing”. 4) Rowing historian Peter Mallory, now world famous for his marvellous work The Sport of Rowing, will talk about a famous Cambridge coach in “Steve Fairbairn: The Man, The Athlete, and The Coach”. 5) The world’s most renowned rowing writer, and historian at the River and Rowing Museum in Henley-on-Thames, Christopher Dodd, who has a new rowing book coming out this spring, will give updates about his museum and other rowing news in England. In the afternoon, at 3:00 p.m. there will be a tour of the Rowing Shells & Equipment at Mystic Seaport’s boat storage in the Rossi Mill (across the street from the Latitude 41° Restaurant), and a reception in the National Rowing Foundation Rooms at Mystic Seaport (adjacent building), where you will also be able to view “Let Her Run”, an exhibition of rowing history, which is mainly built up by historians Bill Miller and Tom Weil. Participation is limited to 100 people, and the cost is $40 to cover cost of light lunch and beverages. Registration information will be posted soon on Rowinghistory.net where you will also find additional information about the event. A trivial note: this is the 800th post on HTBS! The Row For Freedom crew, left to right: Kate-Richardson, Captain Debbie Beadle, Julia Immonen, Kate Pattison-Hart, and Helen Leigh. Feeling a little ashamed that HTBS has neglected to mention Row For Freedom, an all-female team from the U.K., rowing in the Talisker Whisky Atlantic Challenge, we are here trying to emend. Like the rest of the Atlantic rowing teams, The Row For Freedom race to raise money and awareness of a special, noble cause, in their case, the issue of child slavery and human trafficking. According to their website, this female crew of five, Captain Debbie Beadle, Kate-Richardson Julia Immonen, Kate Pattison-Hart, and Helen Leigh, has also decided to try to break two world-records, to become the first female crew to row across the Atlantic Ocean and to do so in the fastest time. The team, hard at work at the oars in their boat The Guardian, has gained a lot of media attention, for example from The Huffington Post the other day, and from The Evening Standard, which could not ignore to mention to its readers that the ladies in Row For Freedom were rowing naked. According to the latest reports, The Guardian seems to be the next boat making landfall in Port St Charles in Barbados. HTBS would like to express our admiration for these five brave women. Well done, ladies! The pine, a standing “o”! Jutting out into the lake. On which he had come to depend. And dragged from the water. He rowed the memory of it, like a mantra. It seldom happens that the sport of rowing gets any coverage in the non-rowing media unless a small newspaper writes about a local rowing hero’s success on the river or the race course, or some of the major British newspapers, for example the Daily Telegraph where HTBS sometimes gets some stories, writes about the British National Rowing Team. I was therefore pleasantly surprised when I came across a rowing article in the renowned magazine The Economist on 7 January. But let me get this straight from the start, because while I find the topic of the article, the transatlantic traffic of rowing scholars, mainly between American universities and British universities, very interesting, it was sad to read the unsigned article in The Economist. Without doubt is was fairly well written, as one might expect of this magazine, but the research for the article was terribly poor. To give you some examples: I do not understand why the author of the article compares The Boat Race and its crews on the River Thames in London with the Head of the Charles’s competitors, instead of the oarsmen racing against each other on the Thames River in New London? Surely, it is fairer to compare the Oxbridge boats with those of Yale and Harvard? Although, when the Oxbridge coaches have four boats to fill, two A-teams and then Isis and Goldie, the coaches at Yale and Harvard have each three boats to spread their oarsmen in. You will find the article here. Team Gallagher Made It Across! Great news, Bernard! Thank you for sharing! Rowing? Yes, There Is An App For That! This past Saturday, 14 January, Patrick Schnöll of Germany released an application for rowing, “iRowCoach”. The app is for Apple’s iPhones and it helps coaches and athletes to track stroke rates, times, and speed like any other of the ‘stroke watches’ that are out there – at a fraction of their price! “iRowCoach” tracks your speed, that is the device’s speed, whether you take your phone in the boat, “which is not clever” (Patrick writes in an e-mail to HTBS), or if the coach has it with them on his/her bicycle or motor launch, of course then going at the same speed as the athlete’s racing shell. The app is compatible with iPhone 3GS, iPhone 4, iPhone 4S, iPod touch (3rd generation), iPod touch (4th generation), and iPad.Requires iOS 5.0 or later. Its available in the USA iTunes Store: here for $1.99 (size: 0.1 MB), in English and German. Yes, I am aware that I am watching a ‘soap opera’, but it is well-played, although – and here Baron Fellowes of West Stafford has to excuse me – I think that the script has its weak spots. But never mind, what is mostly shown here in the USA is so dreadfully bad, both when it comes to the script and acting, that Baron Fellowes’s ‘opera’ is a pure delight to watch. Thank god for public TV in America! This second series of the show is time-wise covering the First World War, and now I am finally getting to why I am actually mentioning Downton Abbey on HTBS. I am not certain how many of Vesta RC’s members died during the Great War, but I surely agree with H.B. Wells in his Vesta Rowing Club: A Centenary History (1969), when he writes, ‘too many of our young oarsmen did not return’. 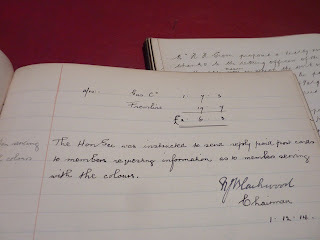 It seems a fire in 1936 destroyed parts of the club’s archives. However, members still, when Wells’s book was published, remembered the ‘gratitude’ shown towards the club in 1920 by the staff and patients of St Dunstan’s, whose mission was and still is ‘to help blind ex-Service men and women to lead independent and fulfilling lives.’ St Dunstan’s was founded by Arthur Pearson, owner and founder of the Daily Express who himself went blind in 1913. 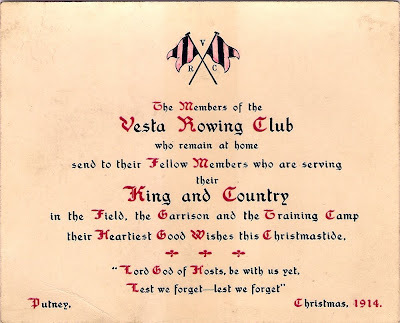 During the War, Vesta RC’s R.J. Calcutt (club president 1905-1919) had taken the initiative to offer ‘war-blinded men’ at St Dunstan’s, rowing at Vesta. The ex-Service men were taught rowing by the club’s members. 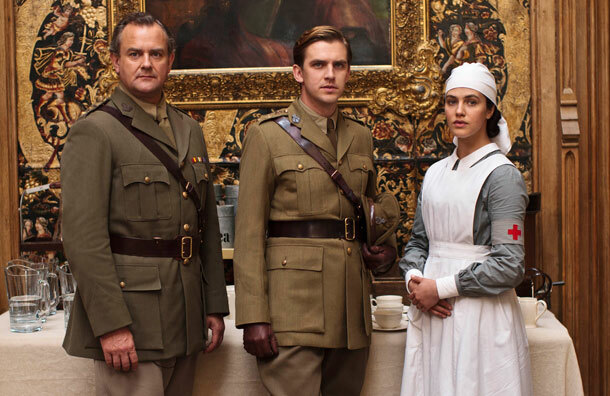 The hospitalised man is then another tie-in to Downton Abbey’s second series. Please, see also "Vesta RC At War 1914-1918", on Monday, 23 January, 2012. After having travelled 2591 nm during 40 days, 9 hours and 15 min., Team Box Number 8, with Toby Iles and Nick Moore, has now reached Port St Charles, Barbados, as the first boat in the Talisker Whisky Atlantic Challenge. Congratulations! HTBS would also like to congratulate Andrew Brown who came in on a second place, breaking the world record for solo rowing, at 40 days, 9 hours and 41 min. Read article and see short film clip about these three brave fellows here. The support boat Aurora reached Row2Recovery, which HTBS has written about earlier, on Saturday to supply the boat with drinking water. For a week the six-man crew has been on water ration down to a litre per day since their desalinator broke. Read more about Row2Recovery’s adventurous voyage here. This post was updated on 15 January. The art pieces in this entry are published with permission of Tonia Williams and may not be reproduced or republished without permission from o4rsom.com - ‘Artwork for Oarsfolks’. 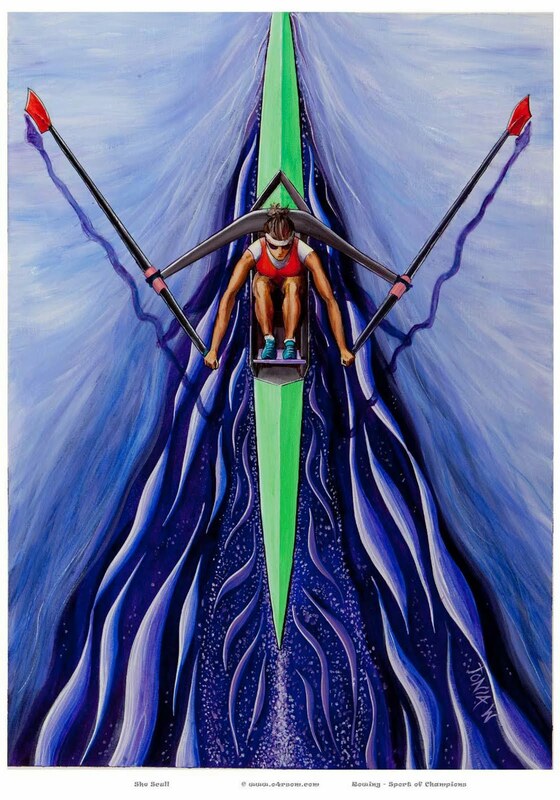 Last spring, Tonia Williams, who was born in New Zealand of parents who had moved there from Great Britain, launched her rowing art at the Maadi Cup Regatta. In 1996, after her elite rowing career was over - among other things, she represented Great Britain between 1991 and 1994, stroking the lightweight four to British rowing’s first sweep-oar gold medal for women in 1993 - Tonia became interested in rowing art. During two decades, while she was pursuing an occupation in architectural and urban design, she was desperately looking for “art that captured the colour and vibrancy of our beautiful sport”, she writes in an e-mail to HTBS from New Zealand. 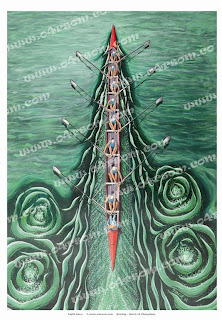 Once Tonia had decided to have a go herself at rowing art, she started o4rsom.com - ‘Artwork for Oarsfolks’ - in March/April 2011 to promote sales of prints and her original art. It is immediately clear to anyone who views her work, that it is created by someone who knows, loves and understands the sport of rowing. Her ‘Artwork for Oarsfolks’ really captures the essence of the noble art of oarsmanship. To try to create international interest for her art, Tonia took a trip to the U.K. where, she writes, the “interest was fairly high, and I received an invitation to exhibit some of my originals at the Henley Royal Regatta Stewards Art Gallery.” They will be retailing her prints, cards, and postcards. Another outcome from her visit to Henley is that she has been given an exclusive exhibition at the famous River and Rowing Museum from May to August this year as a part of the museum’s Olympic build up, she also writes. “Naturally I am keen to build on this momentum and am looking for further profile wherever possible”, Tonia mentions. She continues, “I currently have prints (on a variety of medium), cards and postcards available, and am always happy to discuss arrangements of mutual benefit.” So, if there is anyone who is keen on carrying Tonia’s beautiful art, do not hesitate to contact her here. Now, what I personally think is a great idea is Tonia’s ability to customise ‘original’ art to incorporate club and crew colours to create a virtual original. This has been well received by some clubs and schools, “especially”, writes Tonia, “as end of year gifts for sponsors, coaches, and athletes”. Although, Tonia retired from elite rowing in 1996, she did win the mixed double (with Richard Newey) at the world Masters Games in Melbourne, Australia, in 2002. Presently, she is Commodore of North Shore Rowing Club. 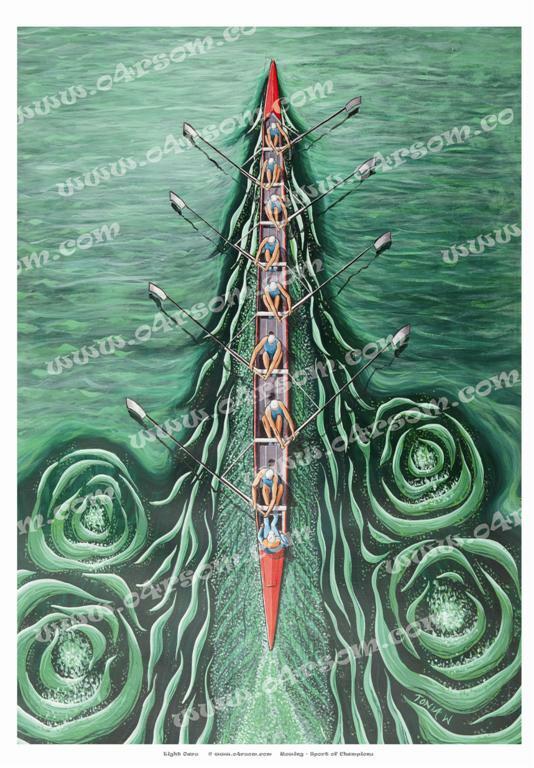 From now on, you will find a link to Tonia’s o4rsom.com - ‘Artwork for Oarsfolks’ - under Buy Rowing Stuff on the right. HTBS wishes Tonia luck in her new endeavour. My widely read interview with Olaf Tufe on Monday, 9 January, contained a very big mistake. I wrote that Olaf’s coach is Eskild Ebbesen, which is not correct, it is Carsten Hassing. My apologies to everyone involved and for any embarrassment caused. I must have misunderstood Olaf in a hasty interview in noisy conditions. The part about the difference of opinion over rate is correct but it is between Olaf and Carsten. 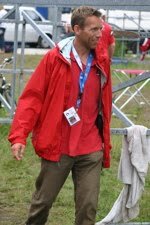 Picture of Carsten Hassing from Rowing Canada. I am happy to report that on Tuesday, 10 January, HTBS was featured on Rebecca Caroe’s website Rowperfect in its series ‘Quirky Rowing Websites’. At first, I have to confess, I was a little hesitant to read what Rebecca had to say about HTBS. Being a pessimist, I did not think that ‘quirky’ sounded very flattering, but I was relieved to read that her interpretation of the word was more leaning towards the meaning ‘original’ than ‘strange’. Please read her nice piece about HTBS here. The least we can do to thank Rebecca is to put up a link to her website Rowperfect. From now on you will find it on the right under ‘Good Rowing Links’. Thank you, Rebecca! Keeping HTBS going with articles almost daily demands a lot of reading, researching, and writing. Of course, this means that one feels close to some of the rowers and scullers; they become favorites, or even ‘rowing heroes’. 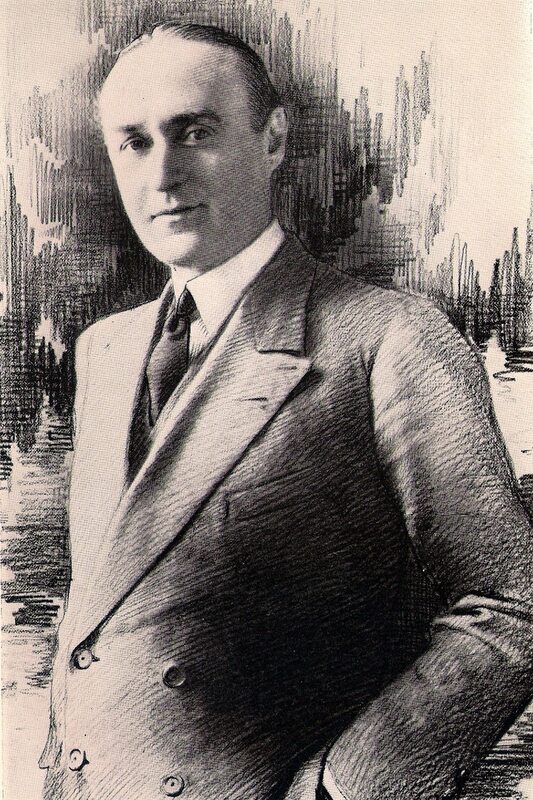 The other day the good fellow Tim Koch sent an e-mail with a link to an article from last year’s spring about one of these ‘heroes’, Frederick Septimus Kelly (1881-1916), who was born in Sydney. Kelly was an eminent oarsman, but also a pianist and composer. At the outbreak of the First World War, he signed up in the British 63rd Royal Naval Division and belonged to the Hood Battalion. 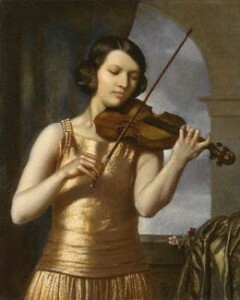 According to the article in ABC News in Australia in May, 2011, during the Gallipoli campaign, he composed a violin sonata for a young female violinist, Jelly D’Aranyi, whom Kelly had met and played with in London. He was killed at the end of the Battle of the Somme, on 13 November, 1916. D’Aranyi played the sonata at his memorial service. The sonata was lost for more than 80 years, but writes ABC News, “it has been rediscovered thanks to years of detective work by Chris Latham, a violinist and director of the Canberra International Music Festival”. Read the interesting article and view a short film clip about the ‘rediscovery’ here. On 30 October and 7 December, 2011, HTBS had two posts about an article and films which were posted on Oxford Today, “A Year in the Life of the Boat Race”. Now, Oxford Today has made a third film available about the Dark Blues and their training, a film as interesting as the first two ones. This installment concentrates on the cox and coxing a Blue boat on the Thames. Watch it by clicking here. Olaf teaches Thomas everything he knows – in 20 minutes. Harald looks on. It is not often that a group of young master rowers from a middle ranking rowing club get to race against one of the great scullers of the day. It is even less often that they beat him. 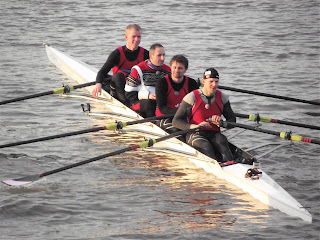 However, this is what happened at Auriol Kensington Rowing Club in Hammersmith, London, on Saturday 7 January. The circumstance, as you may have already guessed, were fairly unusual. Team Norway: Bjørn, Harald, Thomas, and Olaf. One of the most popular television shows in Norway is Senkveld med Thomas og Harald (‘Late night with Thomas and Harald’). In-between their studio interviews they show recordings of various ‘challenges’ that the two presenters have undertaken. They decided that one of these should be a Norwegian rowing crew racing a British crew on the Thames. To this end they recruited the finest sculler in Norway and, indeed, the world, Olaf Tufte. Olaf has been the reigning Olympic champion since he won the single sculls in Athens in 2004 and Beijing in 2008. He also won the World Championships in 2001 and 2003. A good start. They then got Bjørn Jostein Singstad, a young rower with the Norwegian National Squad. Not bad. Unfortunately, the next two members of the quadruple scull were Thomas and Harald themselves. Neither of them had ever rowed. They had no time to learn. Harald had just broken his arm. However, this was not a problem for the television people as, of course, the sole object of the exercise was to make amusing TV for a non-rowing audience. Thus Thomas got about 40 minutes of training, half on land and half on water. He sat at ‘3’ behind Olaf, who was at stroke. Bjørn sat at bow. 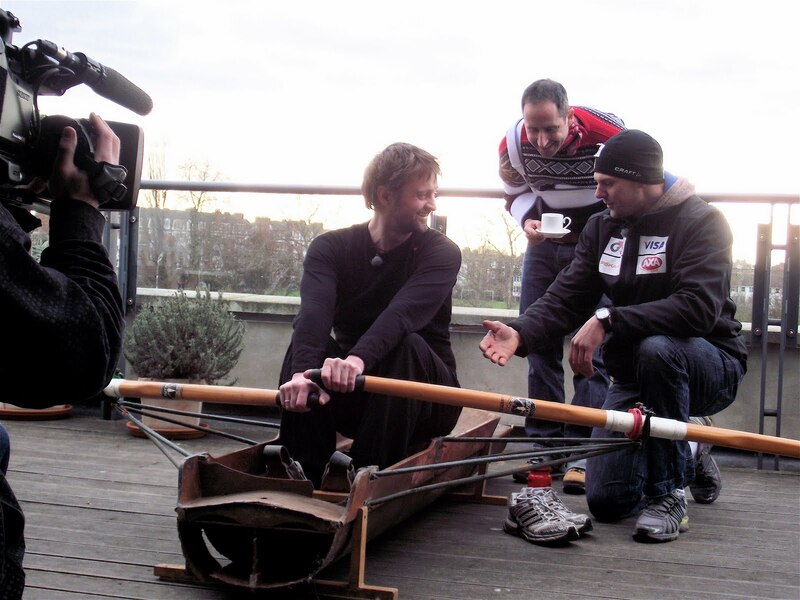 Harald, one arm in a sling, sat at ‘2’, without any oars but with a small Norwegian flag to wave in encouragement. Umpire Martin Gill also had to do a lot of flag waving at the start but the race soon settled down and the result, perhaps not surprisingly, was a win for Ali Boileau, Hugh Mackworth-Praed, Harry Powell, and Nick Hubbard of ‘Team Britain’. I suspect that, in the future, they will tell their grandchildren of the day that they beat Olaf Tufte - but without going into the details. I know that I would. The finish: Team GB beats Team Norway. Team Norway, umpire and safety boat return from the finish. I, of course, had to take advantage of having a great Olympian in the Auriol Kensington clubhouse. 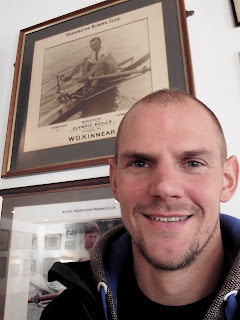 Firstly, I photographed the possible 2012 Olympic sculling champion under a picture of the 1912 winner (Kensington Rowing Club’s Wally Kinnear). Secondly, I asked Olaf for an interview - which he kindly gave. The 1912 Champion and the 2012(?) Champion. What is your form like at the start of the Olympic year? I think that I am well prepared. In the winter, I do a lot of ergs and I feel that I am on the right track. Are you defiantly in the single for the 2012 Olympics? Nothing is ever definite in rowing but that is what I am aiming for and yes, at the moment, I am. After winning two Olympic titles, what keep you motivated? You can always be a little bit better, you can always hear the boat sing a little bit more, a little bit longer..... What keeps me in rowing is that it is a big happy family and the best thing I know is to compete against my good friends...... The one who is going to win in London will be better than the one who won in Beijing and Athens and so on... So as long as you think that you can be better than you were, that is the motivation. Can you win a third Olympic title? If I thought that I couldn’t, I would not be here. 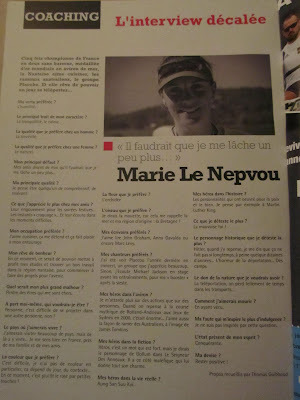 You won the Olympic title for a second time in 2008 despite not winning much in the preceding years. Will it be the same in 2012? True, I have not won much since Beijing. I think the reason for that is that I have been doing a lot of other stuff outside of rowing.... But in the approach to the Olympics...... I have cleared away anything that takes away my energy.... 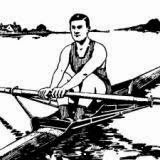 I am focusing more and more on the rowing and everything that comes with it, I am not known for resting..... I think that I am doing some good things now and I have an OK plan but in the end we will see if it is good enough. Tell me more about your plan. I am not doing anything very different to what I have done, I am actually going back to the things that I did in 2008. I have been doing more ergs during the winter like I did in '08 which was not too bad a choice. Then I will probably do more speed work than I have done. I have a new coach (Carsten Hassing*). He is more about higher rating, not low rate and hard push, so we fight a little bit against each other, I want to do the heavy stroke and he wants a high rate. So with that little struggle and fight I hope we will get the best out of both of them and it will bring me even closer to success. Who do you think are the scullers to beat in 2012? ... It’s Mahé (Drysdale, NZ, third in Beijing)... Ondřej (Synek, Czech, second in Beijing) ... Alan (Campbell, Britain, fifth in Beijing) will of course be a big one on his home course.., you never know about Marcel Hacker... then you have the Swede, Lassi (Karonen) but I don’t think he will take the medals, the others are too strong. You have some stars coming up, you have the Azerbaijan guy (Aleksandr Aleksandrov)..., the Cuban (Angel Fournier)... both trying to fight their way into the finals. Excuse the slightly parochial question but how strong do you think Britain’s Alan Campbell is? If he is capable of winning this should be his year. The pressure of competing on his home ground will be a big challenge for him, even if he says it is not a problem, it will always be that way. We will have to see if he can turn that pressure into energy. 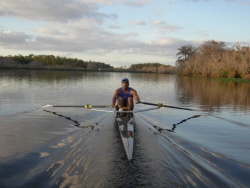 But he is a great sculler, really fast, really strong, so he is one of the guys you have to watch out for. Olaf, thank you very much and good luck in the Olympics. Olaf also mentions that he and his coach, Carsten Hassing, who successfully has coached parts of the Canadian National Team, have discussed the possibility of combining other rowing philosophies, such as higher stroke ratings, with the proven Norwegian technique. Remember, he is going for his third Olympic title and, if successful, he would be the first single sculler to do this since the great Finn, Pertti Karppinen won in 1976, 1980, and 1984. 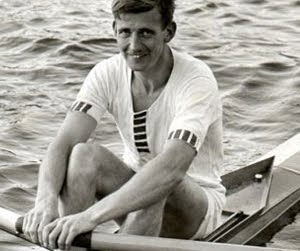 Vyacheslav Ivanov of the USSR is the only other sculler to do this (1956, 1960, and 1964). See also AK News! & "Tufte On The Thames", 25 April, 2012. * Corrections were made to this post on Thursday, 12 January, 2011. 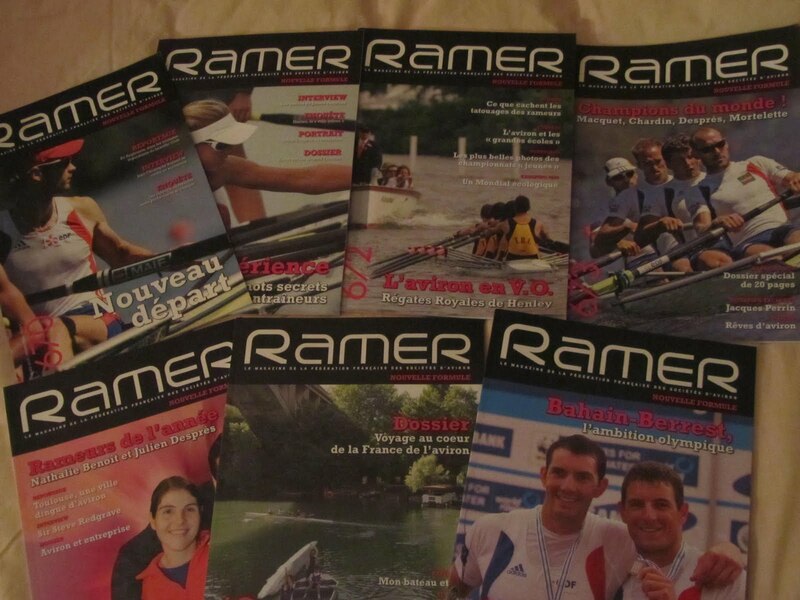 On 24 May 2010, HTBS was happy to announce the new “improved publication, Ramer, of the French Rowing Federation, but issue 676, delivered in November 2011, was to be the last one. The decision was taken by the Federation’s Board of Directors to cease the magazine because the number of subscriptions had been going down, getting lower and lower since the beginning of 2011. In the last editorial, FFSA president Jean-Jacques Mulot explained: “from 3,000 subscribers, they were less than 2,000 of them in a few months [...]. This situation leads us, like other rowing federations before, to choose new means of communication that will rapidly be operational”. 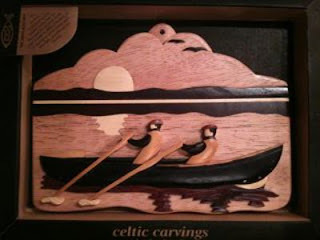 My very good friend Seamus Keating and his wife Margaret gave me a beautiful Celtic Wood Carving for Christmas. Above you can see a picture of it in its presentation box and I thought the HTBS readers may like to know a little bit more about this boat type, “The Currach”. According to Currach.org “Currachs are heritage, culture, history, and athletics all in one; and the history of the Currach is as old as Ireland itself. The first written record comes from Julius Caesar in 100 BC and early Gaelic accounts speak of large ocean going sailing Currachs roving the North Atlantic. 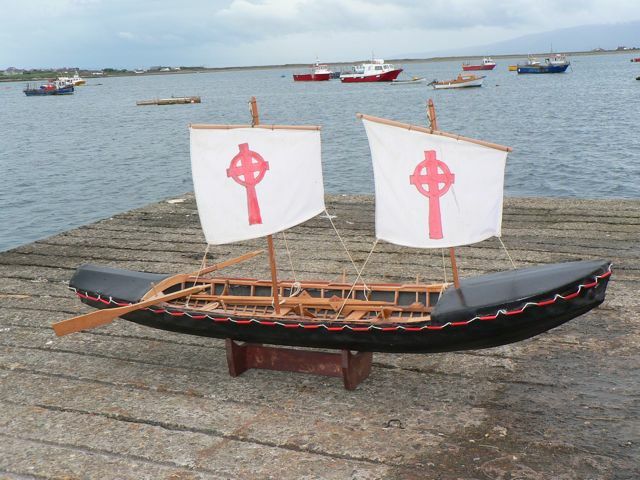 However, such a light and graceful craft were not only used on the sea and it is recorded that in 1602, O’Sullivan Beare, the Irish chieftain, quickly assembled Currachs to cross the Shannon to escape from the Earl of Thomond and his army. A model representing St Brendan’s currach. It would seem that the gift was a precursor for me to look into the history of the Currach at a very momentous time as it is been reintroduced to the east coast of Ireland today, 7 January 2012. TWO HAND-BUILT CURRACHS will be launched in to the Irish Sea this weekend after being built by a team of volunteers in Dublin’s East Wall. The boats were built as part of a month-long currach workshop in East Wall, where artist and boat builder Mark Redden led a team on what’s involved in the ancient Irish technique of boat building. Currachs are traditional Irish boats, which used to be covered by animal skins, and are often found on the west coast of the country. “As a physical thing the currach represents something more than a simple water craft. It stands for the quality of ancient design, a legacy left to us by our forebearers, and a resourcefulness applicable to today’s life,” said Redden. The team behind the new currachs hope that they will be able to compete in regattas off the west coast. The boats were built in the East Wall Water Sports Centre in Dublin’s docklands, right beside the river Tolka. In a piece of good news for the currach team, Met Eireann says that the weekend is going to be relatively mild and less cold and blustery than the last few days have been – which should mean less choppy waters for launching the currach. There is a page on Facebook "East Wall Currachs" with more information and pictures of the boats being built. The Aran Boatmen by Islandcraft Studios. Here is a link about four guys trying to row from Sydney to Auckland, Team Gallagher Trans-Tasman Rowing Challenge. This is one of the worst stretches of water with frequent storms etc. They have had some bad luck with being pushed back and not making progress. I think they thought they might be home by Christmas when they set out, but they are still out there. One of the chaps is James Blake, son of the late Sir Peter Blake of NZ sailing fame (he won us the America’s Cup!) Sir Peter got killed by pirates on the Amazon about ten years ago. Thank you, Bernard for this report. Read more about these brave fellows here, and do watch the film clip above, nothing wrong with the holiday spirit among them. Keep it up, gentlemen! The zone of pure rowing. He is co-author of a new book published by The Council of Europe Publishing. 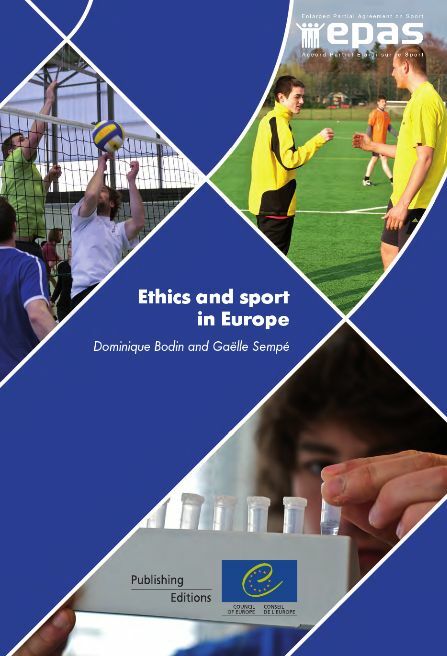 Entitled Ethics and Sport in Europe, the book could be interesting to HTBS readers, all the more as it has an English edition. 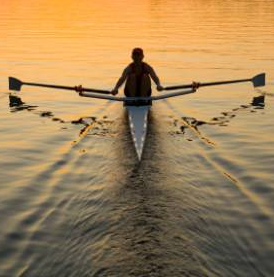 Even though it is not dedicated to rowing, it tackles the historical and philosophical context of ethics in sport, as well as the new challenges to ethics in sport. It’s full of sociological, philosophical, and psychological reflections. The authors are two researchers from Rennes where an international conference was held in 2009. The book contains its proceedings. “Defending ethics in sport is vital in order to combat the problems of corruption, violence, drugs, extremism and other forms of discrimination it is currently facing. Sport reflects nothing more and nothing less than the societies in which it takes place. However, if sport is to continue to bring benefits for individuals and societies, it cannot afford to neglect its ethical values or ignore these scourges”, reads the synopsis. Just before New Year's, I received the last of the 2011 issues of the Swedish rowing magazine Svensk Rodd, edited by my dear friend Per Ekström. 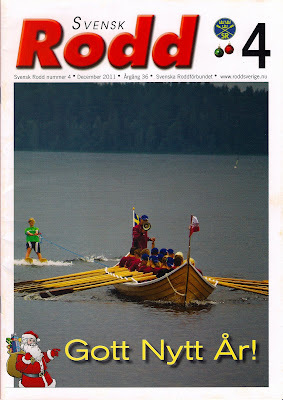 Although, the content is mostly about autumn events and articles by the Swedish rowing stars Frida Svensson and Lassi Karonen to mention a few, for the cover, editor Ekström has chosen a funny photograph taken from the Water Festival held in the village of Orsa in the province of Dalecarlia in July 2011. The only thing I know is that the rowers managed to pull the water skier 600 metres. The province of Dalecarlia, or Dalarna in Swedish, has many clubs rowing in church boats, a descendant of the boats built by the Vikings. Mostly the church boat has ten pairs of oars. Here is a short clip from 2009 showing a start in this boat type. Here is another clip showing the church boats from 'above'. The crews are all women. It looks like fun, doesn't it? While HTBS has written mainly about the British crew Row2Recovery, the Talisker Whiskey Atlantic Challenge 2011 actually has 17 teams rowing in 'the world's toughest rowing race' from La Gomera, Tenerife, to Port St Charles, Barbados. All the crews are racing to raise money for a charity or a good course. After a month on the Atlantic, a few boats have retired from the race due to different setbacks. Read more about all the teams here. 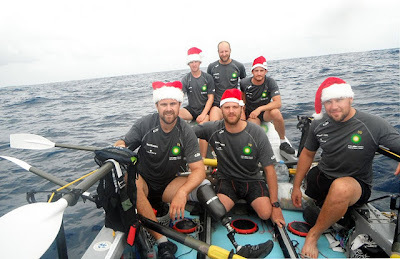 The six British ex-soldiers, Neil Heritage, Rory Mackenzie, Carl Anstey, Will Dixon, Ed Janvrin, and Alex Mackenzie, who form the crew Row2Recovery, which right now is trying to cross the Atlantic, and which HTBS wrote about on 18 November, 2011, has run into problems, writes the Daily Telegraph. The brave crew, four who have lost limbs in combat and their two able-bodied crew members, is running terribly low on fresh water since their desalinator that converts seawater to drinking water broke down. The manual pump also broke down. Their supply of water will run out in slightly more than a week, so it is extremely important that the rescue boat, which has 300 litres of water bottles, will reach them in a week’s time, at the latest. Read the article in the Daily Telegraph here. These brave men’s campaign Row2Recovery to support service men and women has so far raised £625,000.00. They hope to raise £1M during their daring voyage across the Atlantic. Please donate here. Have A Merry New 2012!! !